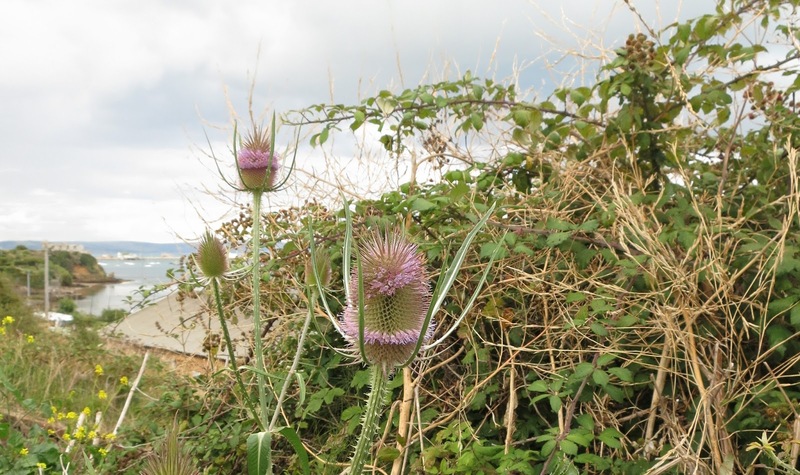 You might like to click the picture to see the teasel in the foreground close up. This is all a rush. Very silly. I dashed out to choose a place for a Stuck Foot Post. 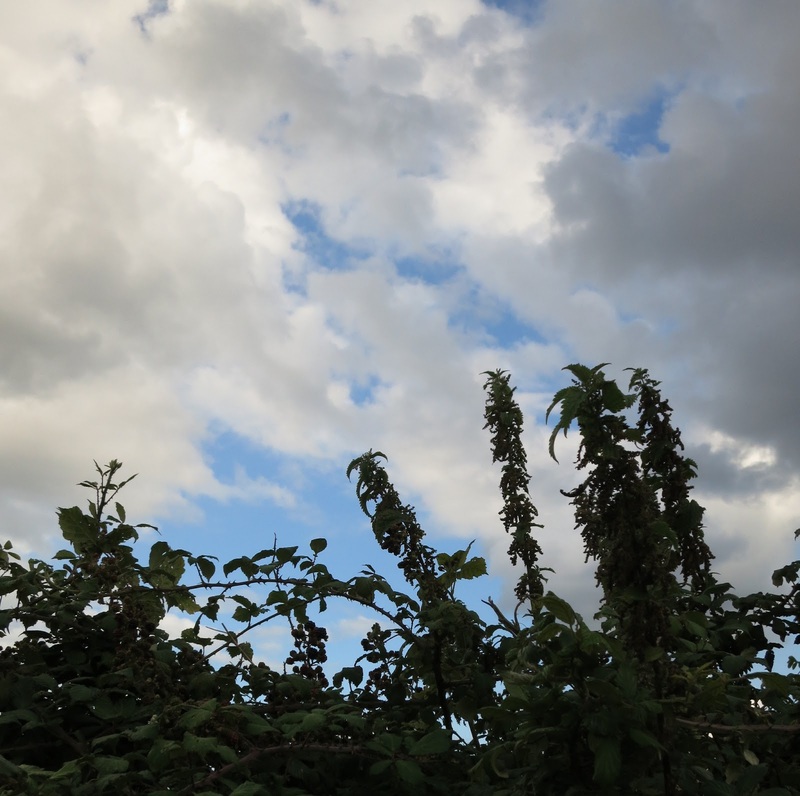 Nettles with their flowers silhouetted against gathering clouds. I thought I might go to the sea and find sand and shells and seaweed and driftwood and all sorts of plants and objects. It was going to be very interesting and artistic - and we haven't been to the sea for a while. Erosion and cliff falls have seen to that. But the moment I set out the weather began to glower. I had to choose somewhere to put my feet fast. I saw some teasels in flower and stopped. I like the sea but I like teasels too. This little flower was a bit pinker than it looks in the picture. I grabbed some snaps and hurried home before the rain started. Initially, I took this to be the flower of the Common Mallow - Malva sylvestris. But I was wrong. 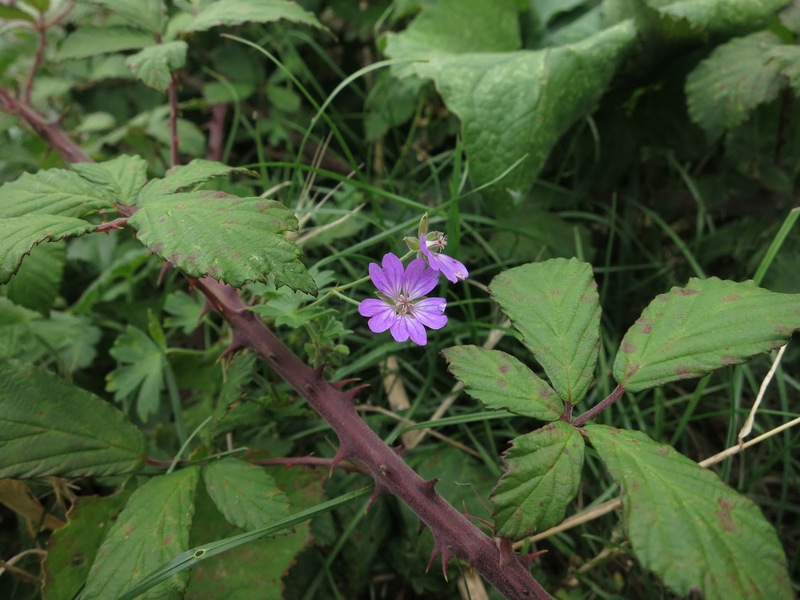 It's a Cranesbill. (But of what kind?) I can never get these two straight! Blackberries are ripening. Some look deceptively tasty. They aren't yet sweet enough to eat - but there are lots of them this year. These blackberry flowers were tucked under the hedge. And when I got home? The rain came in a great squirt - as if someone had turned a hose on and was directing it directly at the windows while throwing pebbles at the same time. It didn't last long - but I'm glad I didn't go to the beach. is that you choose a place and put your foot there. Any old place will do. You can choose it because it's familiar and you want to know it in more detail. Or you can choose it at random. Then you see what you can see. Without moving your feet. Not once. Not even slightly! starting on Thursday 31st August. You come up with the neatet ideas Lucy. Somehow I completely missed the tree following at the beginning of this month ... I'll be sure to be ready for September. Lucy you have the best ideas and my Monday post was a Stuck Foot post. I hope to join in every time you do this...it was great fun and I had lots of buzz from the post as you will see...I love teasels but they are banished from my garden and meadow as they are uncontrolled here and take over instantly. So I will enjoy yours. I like teasels as well, and grow them on the plot. 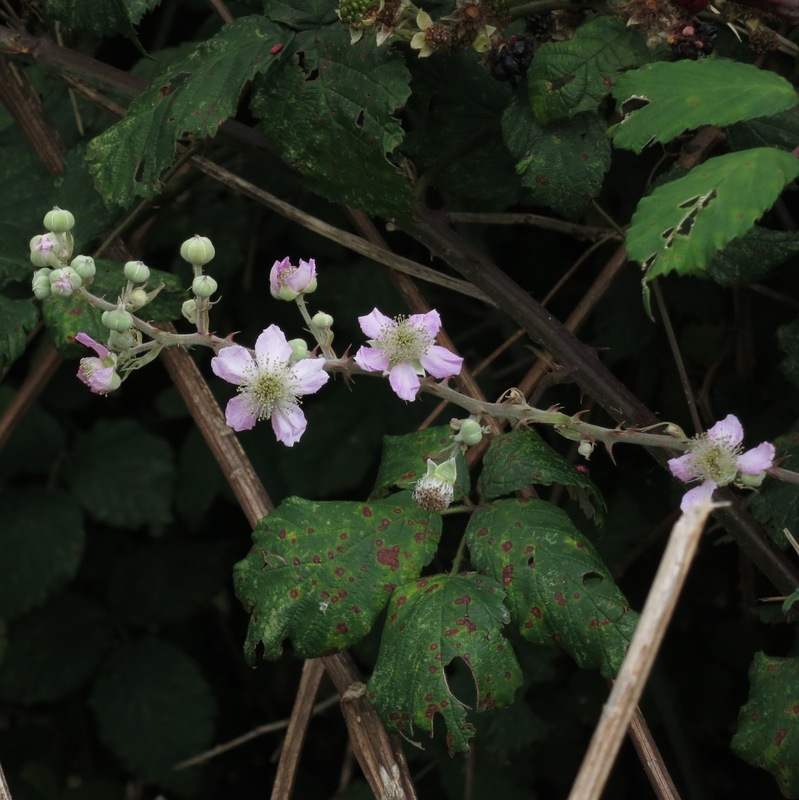 That doesn't look a common mallow flower to me, and I've been picking blackberries for several weeks now. Hi Linda. Looking forward to learning about your honeysuckle tree in autumn. As you know, I've not come across anything that substantial in the honeysuckle line before. Donna. Your post is beautiful. I've added you and your blog to the list of Stuck Footers on the Stuck Foot Page. Linda - would you like to become a Stuck Footer? Hello Mike. I agree. I think it's more likely to be a Cranesbill. I always have trouble telling the two apart. Indeed, if I ever say it's one it's almost invariably the other. Interesting how fruits ripen at different rates round the country. I always hope for blackberries long before they ripen and have to remember it's nearly always as late as the end of August / the beginning of September before they are pleasant to eat. It's surprising given the amount of sunshine we've had recently but I think it's the side of the hedge that's reachable in relation to the sun. Hi Lucy, have posted my "Stuck-foot post for August,hope it's ok . It was nice to stop and stay in one place foe a little while for a change. Making the most of the Blackberries, 3 jars of Chuckny made to day from them. I'm not sure which one it is.